Promilless is an extremely reliable and easy-to-use saliva test strip, which quickly indicates whether you are fit to drive. The result of the test strip is clearly readable from the colour reaction inside the green and yellow colour frame. The result can be read as soon as the slightest colour reaction has occurred. The colour does not need to be separately compared with colour scales. The test strip has a self-testing feature, which indicates the functionality of the strip to the user, taking in to account any possible incorrect storage, the end of the product’s life cycle and incorrect use conditions. Two separate test strips packed in foil. The products of the online store are sold by Goodwiller Oy, business ID 2532512-7. We sell products to private individuals over 18-years-old in Finland and the EU area. We reserve the right to change the prices and delivery costs. 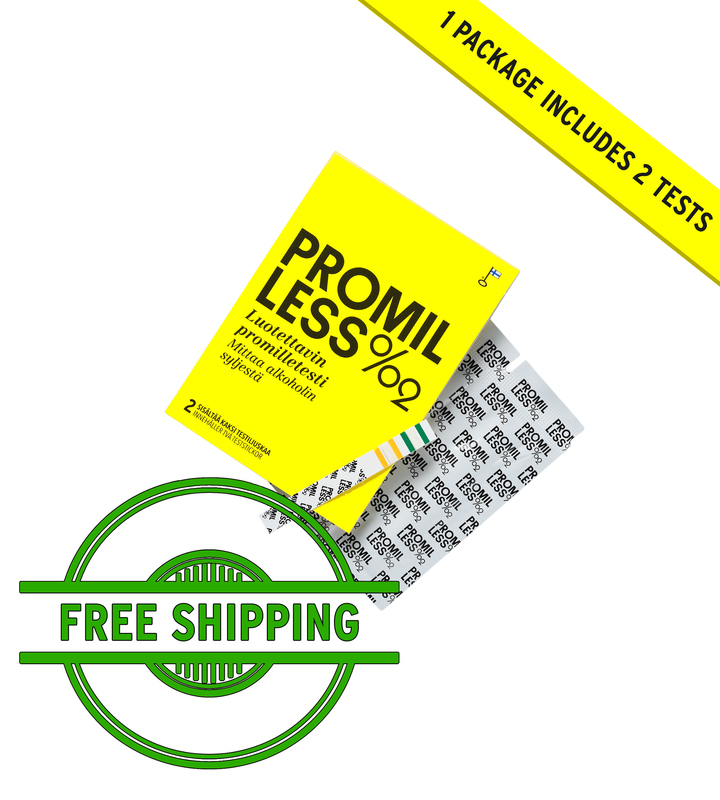 In principle, the products are ordered over the Internet at www.promilless.fi via the shopping basket. All orders are confirmed with an email, which indicates the price of the order, delivery fees and the ordered products. The receipt of an order confirmation requires the notification of an email address in connection with the order. The customer agrees to the valid delivery terms in connection with each order. Products and their shipping costs will be paid when placing the order. The following payment methods are available at the online store: Nordea, Osuuspankki, Danske Bank, Aktia, Nooa, POP banks, Savings banks, Handelsbanken, S-Pankki, Ålandsbanken and payment cards Visa, Mastercard and American Express. Payments are completed via Paytrail Oyj’s website. The payment brokerage service implementer and the payment service provider is Paytrail Oyj (2122839-7) in co-operation with Finnish banks and credit institutions. Paytrail Oyj will appear as the payee on the account statement or card invoice and will forward the payment to the merchant. Paytrail Oyj has a payment institution license. In reclamation cases, please primarily contact the product supplier. The payment brokerage service related to online banking transactions is implemented by Paytrail Oyj (2122839-7) in co-operation with Finnish banks and credit institutions. As far as the customer is concerned, the service functions just like conventional online banking. Depending on bank connections, the delivery time is usually 1-3 business days from the payment of the invoice/product. Exceptional delivery times shall be notified on Goodwiller Oy’s – promilless.fi / online store’s homepage. The delivery fees include postage and packaging costs. You can see the delivery fees, once you have selected the payment and delivery method in the shopping basket. We shall deliver orders as letter deliveries. Customers have a 14-day right of exchange and return in accordance with the Finnish Consumer Act. The right to return only applies to resaleable and useable products that are in their original packaging. We do not accept returns that are made more than 14 days after delivery. When a return has been accepted, the funds shall be returned directly to your account after the receipt and processing of the return. A notification about an incorrect delivery or faulty products must be made within 14 days from receiving the product. If the package is damaged by Post, a reclamation to Post must be made for the product immediately. We reserve the right to review our delivery terms. Prior to ordering, the customer must familiarise in any delivery terms valid at that time. Goodwiller Oy shall process all customer details with complete confidentiality. Goodwiller Oy agrees to not disclose any customer details to third parties.